University of Ulster PhD student David Bishop was runner-up in the Institution of Mechanical Engineers (IMechE) medical engineering project competition. This prestigious international annual competition, which is sponsored by Vicon and attracts entries from all over the world, focuses on the use of engineering principles within healthcare research. Selected as one of only 3 finalists, David who is from Carrickfergus, had to give a 12 minute presentation on his project entitled: 'The Development of a Biomaterial for Spinal Cord Injury via the Manipulation of Neural Cells by Micro/Nano Topographies’ at (IMechE) headquarters in Westminster, London. The presentation was followed by questions on the research from the judging panel made up of healthcare professionals from both academic and industrial organisations throughout the UK. David is now undertaking PhD study with the Biomaterials and Tissue Engineering Research Group based in the Nanotechnology and Integrated Bioengineering Centre at Ulster's (NIBEC) Jordanstown campus. Supervised by Professor Brian Meenan and Dr Adrian Boyd, his research focuses on polymer surface modification by atmospheric plasma processing for the creation of smarter biomaterials. The goal of which, is to produce materials that can then be used to manipulate and control stem cell responses and induce the regeneration of various biological tissues. David who graduated from Ulster with a First Class BSc (Hons) Biomedical Engineering degree in 2011,was highly commended in the Engineering and Mechanical Sciences category of the Irish Undergraduate of the Year Awards for his research on: 'An ion selective sensor for the detection of elevated levels of Troponin I (TnI) and Heart Type-Fatty Acid Binding Protein (H-FABP) for the prediction of repeated myocardial infarction in cardio-trauma patients'. The Undergraduate Awards are the foremost awards of their kind in Ireland and receive thousands of entries each year. 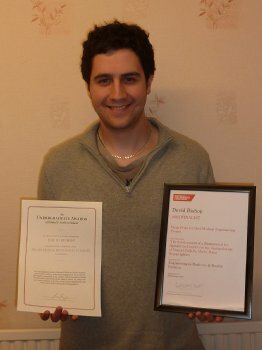 As an undergraduate David completed a successful placement year with Boston Scientific, winner of one of the University's annual Placement Employer of the Year Awards; He was also awarded a Nuffield Research Scholarship which funded the initial stages of his IMechE project and the McCrea-Leebody Award for academic achievement within the Faculty of Computing Engineering. NIBEC is a world class engineering research centre and isone of three research facilities based within the Engineering Research Institute and the School of Engineering.